of birch and hazel, rowan and alder. Raasay, a slim island, lying between Skye and Applecross, has many resources: a mild climate, housing, vegetation, harbours, history and culture, a primary school, an outdoor centre, two churches, a newly-built, architecturally-designed community hall, initiated and managed by voluntary effort, as was also the new playpark. Yet it is riven with discontent and disagreement. This is a pattern familiar in many Hebridean island communities and has been interestingly discussed in Malcolm Gladwell's new book, 'Outliers', where he sees such patterns of dispute in areas where the Scots-Irish emigrated in America. He believes these patterns are repeated from generation to generation in small remote communities. Summer tourists cycling or walking, geologists, botanists and others on field study expeditions, rich holiday home owners, young people on activities at the outdoor centre would not be aware of the pain and disappointment that eats at the heart and enthusiasm of young people looking for a future on the island. A certain sadness is almost palpable. Half the houses lie empty for large parts of the year and crofts lie neglected, or used very occasionally by descendents of crofters willing neither to work them nor give up their ownership. A handful of crofters hold sway over all the land. Young families are forced, meanwhile, into caravans and wherever these are placed is regarded as 'unsightly'. There is a hotel and a tiny youth hostel and there was Raasay House. This is where the Macleod chief lived when Dr Johnson and James Boswell were given hospitality in 1773. The house has lawns leading down to the sea and a fertile walled garden, once managed by skilled gardeners with glasshouses and hotbeds, raising grapes, melons, summerfruit and all kinds of vegetables and fruit trees. The outdoor centre has rented the house in recent years from Highland and Islands Enterprise who awarded a generous grant for its refurbishment, added to by the lottery. On the night of 20 January 2009, when the refurbishment was almost completed, the centre of the house burnt down, leaving only the west wing and the façade. 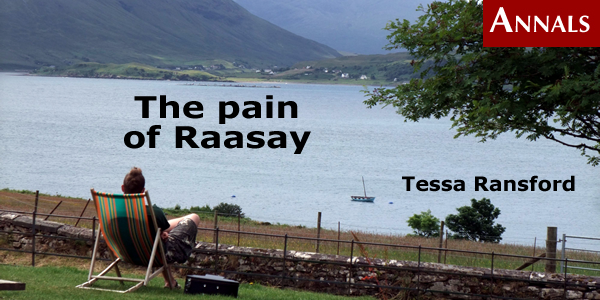 Raasay's landlords were often oppressors of the population, using the island as a feasting and pleasure ground. 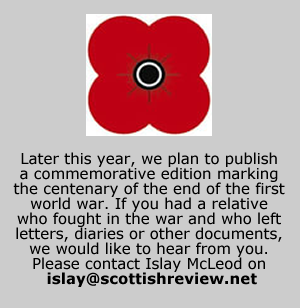 Rainy, in the mid-19th century in particular, was excoriated by poet Sorley Maclean (1911-96). Sorley Maclean was born and brought up on Raasay, and his poem 'Hallaig' is inspired by a clearance village of that name on the east side of the island. Roger Hutchinson's book 'Calum's Road,' describes how in the rocky moorland of the north of the island, an area deliberately kept – indeed even walled off – as a hunting and shooting ground by the landlords, the lack of population was an excuse for not building a road. Even the dead had to be carried for several miles, or taken south by boat to the cemetery. No road led to lack of population in a vicious circle, ending in desertion of settlements from the north of the island. During the first world war, some 200 German prisoners of war made the working of iron-mining feasible on Raasay, bringing in skilled joiners, masons, miners, electricians and engineers. Houses were built in the village and enclosed in fencing and barbed wire. There was one toilet for 40 men, one tap for 50, three sickbeds for every 100 and eight or nine men were allocated to each but-and-ben. Some 40 other British people also worked on the mines and 20 local people. The present village, with its two rows of whitewashed houses facing one another, with their garden strips behind and common ground between, stems from this time. The pier, built for the mining operation which ended in 1919, is now almost derelict. A new pier is being built in the bay in front of Raasay House to accommodate bigger Calmac ferries. The island continues to offer itself as a pleasure ground. Ordinary daily human life has little support or encouragement. The primary school, the hotel, the shop and post-office (not accessible to the disabled), the new village hall and playpark are the only amenities for those who live permanently on the island. Sorely Maclean wrote of the Clearances which left the island bereft of men, women and children, home only to the lovely birchwoods and waterfalls. Raasay has the most exquisite views: Dun Caan, the central chimney-like hill gives a panoramic view which includes the Cuillins; from Suisnish in the south there are serene views over to the red Cuillins and the mainland; from the north views of further islands. Raasay Sound and the Inner Sound must be among the most beautiful pieces of water in the world, and yachts float by in the shimmering ever-changing light. Surely now, in the 21st century, real people with families, who do not inherit crofts or land but who are prepared to give what it takes to live and work in the islands, should be invested in by Highland and Islands Enterprise and the Crofters Commission and treated as valuable, given help and encouragement, provided with housing, business facilities and some share of cultivatable land for trees, vegetables and livestock other than sheep. Tourism, in contrast, is a phoney part-time 'industry', into which huge amounts of money are poured and for little avail. Many who provide its working staff are summer-only immigrants and students. For much of the year the hotels, holiday homes, cafes and B&Bs lie empty or under-utilised, lost opportunities for those that remain. That hostile history, mentioned by Iain Crichton Smith, still takes its revenge on modern inhabitants whose goodwill and desire for a genuine, ecologically-valid life in a real, living community, is denied them by the vicious in-fighting (when no-one can speak to anyone because everyone knows everyone) and the economics that drive away the young people and the young families, welcoming the sheep who range freely on common land, the many empty fields, and promoting the tourists.